These unfinished barn stars open the world for your home and garden decorating! You get to be the artist and create whatever design you want. We provide you with two choices of metal barn stars. Galvanized metal will NOT rust and regular metal WILL rust unless it is protected or painted. Now you can rust or paint your own metal stars! For those of you wanting to paint your own galvanized metal stars please be sure to use primer or paint made for galvanized metal. If you would like some tips for painting on galvanized metal please visit our page "How Do I Paint My Metal Stars?". Sometimes known as tin barn stars, our metal stars are not made from cheap thin tin. We are sure you've seen the cheap tin stars in stores and when you pick them up you can feel how flimsy they are. 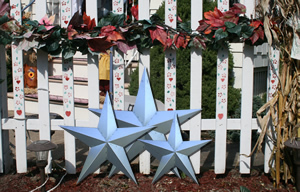 Our metal barn stars are made by the Amish here in Ohio and made from HEAVY DUTY 22 gauge metal. So put on your thinking cap, pick up your paintbrush and let your imagination run wild! 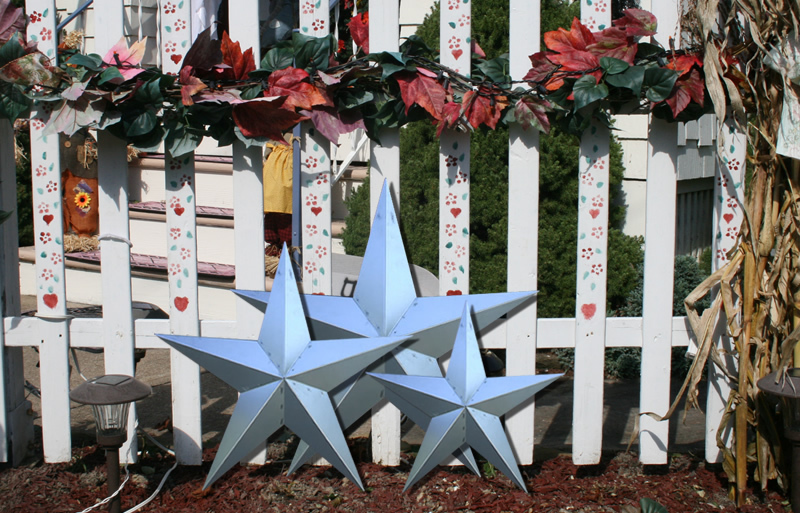 Create a barn star masterpiece with these unfinished metal stars. All stars come with a welded hang tab on the back. Regular metal so you can rust your own! Ready to prime and paint with your latex or oil base paints.